This 4 wheeled shopping trolley is a lightweight and stable shopping solution. These attractive trolleys have front swivel wheels making them easy to manoeuvre. It has no rear axel which means the user can walk closely behind without risk of tripping. This 4 wheeled shopping trolley is designed to be totally safe to walk and lean on and are ideal for those with arthritis, rheumatism and other walking problems. It has plenty of pockets both internally and externally for accessories. 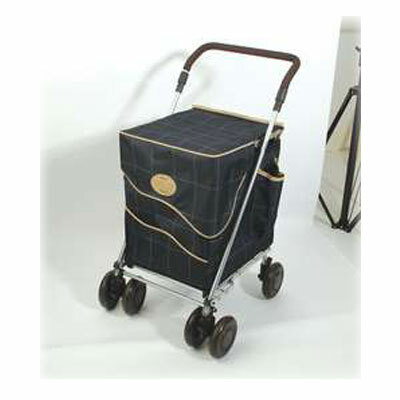 The trolley has an internal front zipped pocket and three internal rear pouch pockets. Two multi purpose side puches for walking sticks, umbrellas, magazines, flowers and so on.